Epping Forest District Council has now submitted its Local Plan for Examination. The Inspector has produced a timetable and document, including a set of questions. for hearings in 2019. LRA, SaveJesselGreen and others will be attending some of the hearings to oppose various aspects of the Plan, including the idea of building on Jessel Green. It’s important to remember that the Inspector will solely be looking at whether the Plan is “sound” (that is, it has been prepared in accordance with the relevant legal requirements) and may agree changes to make it “sound”. Other than this, she will not consider making any other improvements to the Plan. The High Court has dismissed a developer's legal challenge to the Epping Forest District Council’s Local Plan, paving the way for the Council to submit the Plan to the Secretary of State for Independent Examination (the challenge could, if successful, have had a significant effect on the progress of the Plan). See the Council’s statement here – we will be considering the implications of the judgement. On March 20th, a judge agreed that there should be a Judicial Review hearing in May on a developer’s objections to the Local Plan. Until then, the Council will have to defer submitting the Plan to the next stage of the process. LRA is contesting a number of points on which we feel that the Plan is unsound. In particular, we object strongly to the Council’s proposal to build housing on Jessel Green. LRA has sent twelve representations to the District Council, setting out what it sees as the serious mistakes in the Local Plan, including calling for Jessel Green to be dropped from the development list. The next stage will be a hearing in front of a Government Inspector, probably in Autumn 2018. At this stage, to get the Plan changed, we have to show that the Plan is not soundly based and is not the most effective way to deliver the required results in the Plan’s period. We know that the District Council won’t change anything at this stage, so our representations are aimed at this Autumn’s hearing. Find details about what’s happening, and the Local Plan itself. LRA will be pointing out to the District Council what’s wrong with the draft Local Plan, in preparation for the formal hearing in the Autumn. Despite strong opposition to various aspects from LRA Cllrs, and Cllrs from other parts of the District, at a Council meeting on December 14th the Conservative majority pushed through their current draft Local Plan. Following pressure from LRA, Traps Hill car-park had been dropped from the list of developments, and Rochford Green had also been omitted. However, some of Jessel Green, Luctons Field and the car-parks at Loughton & Debden stations, are still on the list, and the County Council wants to redevelop the Traps Hill Library building to provide housing and a library, which means the Library, Town Council, CAB and National Jazz Archive will need relocating while work is carried out. LRA Cllrs put forward a motion to exclude all public urban open space from development under the Plan but this was defeated. The next stage in the process restricts representations to the District Council on the legal compliance and soundness of the Plan. More on this here and here. LRA and Loughton Town Council will of course be responding, and this should mean that next Autumn both bodies will be invited to speak at the final stage of the process – a formal hearing on the Plan in front of a Planning Inspector. The District Council aims to deliver the development of 11,400 new homes in the remaining 15 year plan period. The Inspector will want to see a rolling 5-year land supply capable of meeting the identified housing need. Furthermore, in order to meet the housing targets required by national policy, the Council will have to demonstrate that it can achieve a dramatic improvement in the number of new homes brought forward annually. The annualised average requirement for new housing in the district is approximately 518. However, over the past years only 150 – 220 dwellings per annum have been delivered, leaving the Council with a significant shortfall of approximately 1,500 dwellings for the years 2011 – 2017. This shortfall must also be delivered in the Plan period. We will keep residents posted on progress. The Government recently proposed that the number of housing units to be built in Epping Forest District should go up from 514 a year to 921 a year – an impossible target! The Council say that even 514 units a year would mean building on Loughton’s open spaces – we know the vast majority local residents are against this, as is LRA. 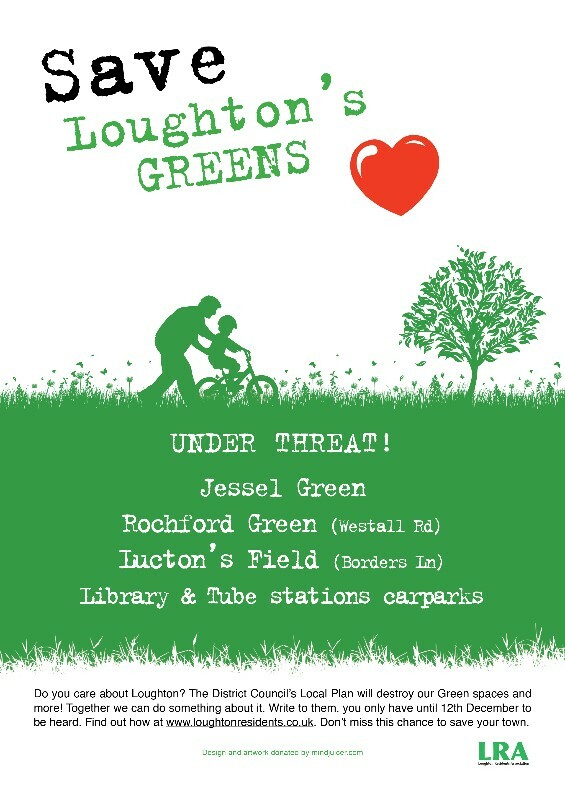 They are proposing to build on some of Jessel Green, a much-loved green that Loughton people have enjoyed for decades. The car parks at Debden and Loughton stations are also threatened. The County Council wants to redevelop the Traps Hill Library building to provide housing and a library, so the Library, Town Council, CAB and National Jazz Archive will need relocating – temporarily or permanently - before work starts. Following pressure from LRA, Traps Hill car-park has been dropped from the list – at least for the time being. There will now be a public consultation on the soundness and legal compliance of the draft Plan. LRA will question the soundness of the Plan, and particularly the deeply-flawed site selection process; we are prepared to take the fight forward to the full-scale hearing before a Government Inspector (probably in Autumn 2018). Follow us on Facebook or Twitter, or look out for updates on our website. Draft Local Plan. LRA is considering our options should the District Council persist with what we see as extremely harmful proposals, such as including the Debden green spaces and the Traps Hill car-park in the list of development sites. Here’s a summary of the work the Council is currently undertaking on the Plan. There will then be a 6-week public consultation on the latest draft, before it goes to a formal hearing in front of an Inspector. At this stage, if the Debden green spaces are still on the list for development, and if we think there are other serious things wrong with it, we will let residents know and ask them to give their views. If this doesn’t make the Council put things right, then we will challenge the plan at the formal hearing. The Consultation is now closed. Over 600 residents copied us in on their responses – thank you! LRA response here & Loughton Town Council response here. Help Save Loughton's Open Spaces - Now! 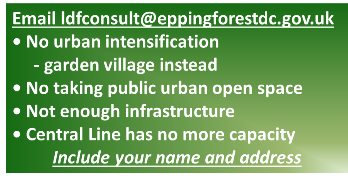 Tell the Epping Forest District Council which sites you value – and why! You can find out more,and how to make your views known, in our latest Townwide Loughton Life newsletter. Please tell the Council which sites you value – and why. You don’t need to be an expert! Just think what you’d say to a friend who asked you what you thought – and write down your answers. LRA to fight District Council threat to build over Loughton’s green spaces! The new District Local Plan will affect how the District develops. A Public Consultation starts October 31st. You can find out more, and how to make your voices heard, in the latest Townwide edition of our Loughton Life newsletter and email news bulletin. We’ll add a list of suggested replies here in the next few days. Copies of the “Townwide” are being printed and will be delivered to Loughton households in a week or so. LRA Statement. The new District Local Plan will affect how the District develops. This Autumn there will be a Public Consultation. We’ll bring residents the details, and how to make your voices heard, in the end-October Townwide edition of our Loughton Life newsletter and here on our website. Most of Debden’s green areas – and open areas elsewhere in Loughton – will be built over if the Conservative-dominated District Council (“EFDC”) have their way, according to their draft Local Plan. At every stage of the development of the Plan, LRA Cllrs have made it clear that they oppose these proposals, and that they expect the vast majority of Loughton residents will do so too. At the end of October, EFDC will launch a Public Consultation on the Plan. In the week commencing October 24th they will deliver a leaflet about the Plan to every household in the District. 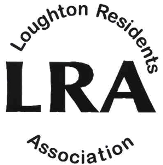 At the same time, LRA will provide every Loughton household, explaining what’s involved and how residents can make their views known. At this stage we hope – and expect – that residents will give these aspects a resounding “thumbs- down”! The details of the draft Plan can be found at the Epping Forest District Council website (item 7). 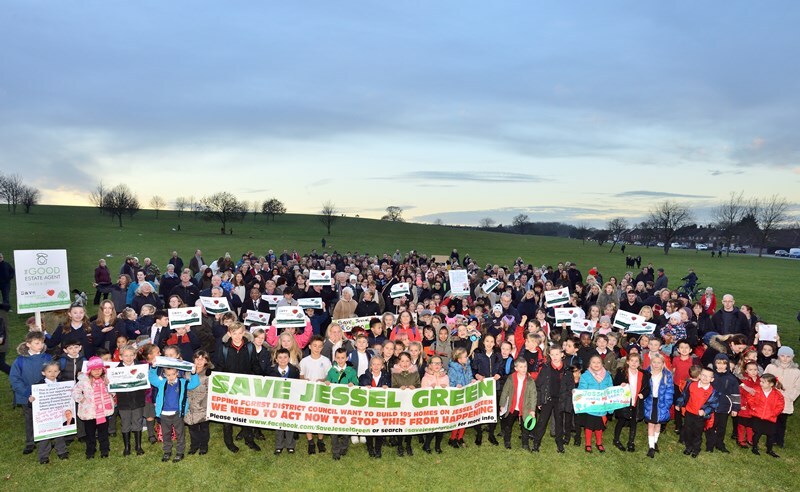 EFDC want to build 195 houses on Jessel Green, which they own, pocketing the sale or rental proceeds. This is the big open hillside between Colebrook Lane and Jessel Drive. (There is already a campaign group objecting to this – see the Facebook page). They want 53 houses on Rochford Green (which they also own) near the Princess of Wales pub (previously the Clydesdale). They have designated Luctons Field, opposite the College, to take no fewer than 304 dwellings - this field is owned by Epping Forest College. Despite strong LRA protests, last year EFDC just threw away a protective covenant that restricted it to educational or NHS use; at the time the College said the field was primarily intended as the site for a sports centre. EFDC also want 158 houses on the College Middle Site, which was also subject to a protective covenant which the Conservative majority threw away. Other sites they have put forward include Traps Hill car park (44 houses), Debden Station car park (193 houses) and Loughton Station car park (114 houses) - the car park sites doubtless involve massive buildings over underground parking to replace the lost ground-level parking spaces. The proposals will be discussed at an EFDC Cabinet meeting on October 6th and then at a full Council meeting on October 18th. Assuming that the draft Plan is approved, there will be a Public Consultation, which will run from October 31st to December 12th; EFDC may then revise the Plan. There are then further stages to go through before the Plan is finally adopted. EFDC are already well behind their original time-table for producing the new Plan, and we would not want to further delay its introduction unnecessarily. However, should EFDC not take the expected public outrage into effect by amending the draft Plan, the LRA will continue to the fight these proposals at every stage. The Local Plan governs many aspects of life in the district, including planning for housing and employment. In preparing the new plan, EFDC is required to consider all potential sites for housing. The Conservative majority on EFDC have already forced through a wholly out-of-character seven-storey building at the end of Debden Broadway, now under construction. They are also developing a “retail park” on Langston Road where it appears that – despite their promises at the outset - the retailers they are bringing into Loughton will create extra direct competition for retailers in The Broadway and Loughton High Road. Loughton Residents Association is a very active group of local residents who care for Loughton and its environment. Our membership is around 1,000 households, and we have been in existence for over 30 years. We are independent of any political party. We seek, and listen to, the views and concerns of Loughton residents and take action in support. We have a majority of the councillors on the Loughton Town Council, and councillors on Epping Forest District Council & Essex County Council. We have our own regular printed and email newsletters to residents and this website. This statement is also available online. The new Plan will affect how the District develops. This Autumn there will be a Public Consultation. We’ll bring residents the details, and how to make your voices heard, in the end-October Townwide edition of our Loughton Life newsletter and here on our website. The new Plan will affect how the District develops, in terms of housing and other building, the level of local employment and in many other ways. LRA and Loughton Town Council will be playing our full part in the formal consultation – and then in the legal processes needed for the Plan to be approved. Meanwhile, we - and some residents - are concerned that the draft Plan may list some of our green spaces for possible development. No decisions have been taken yet. We will be asking residents to make their views known in the consultation process - we will do our best to protect Loughton’s green areas! More from Epping Forest District Council.